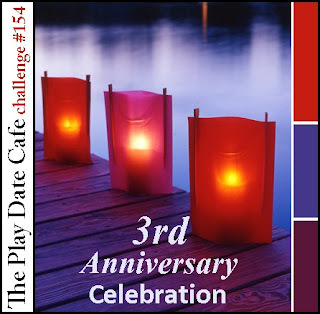 Tsuruta Designs: The Play Date Cafe: Ticket to Ride! Hello and Welcome to The Play Date Cafe #154! This is a super special challenge because it is also The Play Date Cafe's 3rd Anniversary Celebration! My methodology of color challenges is to go to my patterned paper stash first to see what I have...then embellies...then ink/stamps. Throw in the fact that I'm not a purple girl, I was starting to sweat fret. I'm a huge fan of giving gift cards so this will be going to a nice home soon. Get ready to party over at The Play Date Cafe!!!! There will be random giveaways there too!!! Prizes! 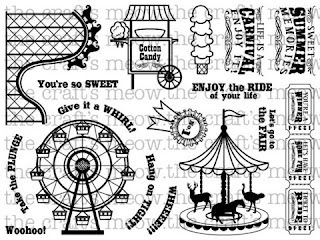 There will be multiple prizes available...be sure to check The Play Date Cafe blog for the deets! 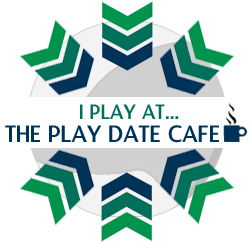 Check out the new 'I Play' badge...post it on your blog and link it to The Cafe....there will be random prizes for peeps! Alumni Guests! The Cafe will be welcoming back many of the alumni designers! Have you seen the all NEW look over at The Play Date Cafe?!!! It's pretty spectacular...fresh AND fun!!!! soooo cute and love how you did the tickets!!!!! Wonderful gift card. So fresh, fun and clever!!!! 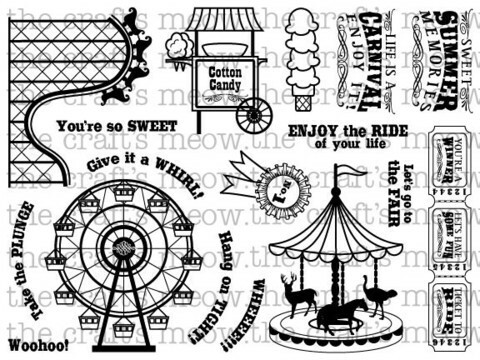 FAB stamping!!!! Mmmmm, you have the best chevron patterns, Amy. Your gift card holder (and card) is fresh and fun. Eeeeek! Cutest card ever! Love that bag and how you used it with the tickets, genius! well that is completely adorable. great way to pocket a gift card. Love how you incorporated the colors! Love love love love this!!!!! LOVING that chevron bag and those tickets are AWESOME!!!!! Oh Amy, love how you did this. I like your process for color challenges and I might have to try doing it that way. Amy your project is fantastic! I love the chevron striped bag and those tickets are amazing! What a great way to present a gift card. sweat? YOU??!?! silly girl... you so totally ROCKED it, purple & everything!!! (plus i looooooooooooooooove that little stripey paper bag! so so sooooo totally ♥FAB♥ and perfect for a GC!!! Love the colors and the adorable bag! So clever!! So fun! Love the bold bag and the stamped tags! You so rock this challenge, Amy! the color combo would have stumped me! LOVE your take on this! I love all those tickets...fabulous take on the color inspiration Amy! GREAT card Amy! Love all the tickets! Super cute card Amy! Love those tickets! Well done, Amy! Love this little GC bag! How you used the tickets and colors is fabulous! Oh my word - this is so CUTE!!! You make it look so easy but I know it's not! Love the little bag for the gift card. You totally rocked those colours, Amy! Your card is perfect... tickets, mini bag, twine, what's not to love?! A chevron glassine bag?! Or did you make it? Either way, I LOVE, love, LOVE it for a gift card holder!! The tickets tied on top are so fun ... you totally rocked these colors, Amy! I did not blog yesterday, Amy, but saw this on Facebook, awesome gift card holder. Happy Friday! THis idea is so cool, and it is so fun too with the colors and patterns you chose! Such a fun interpretation of those bold, bright colors, Amy! super fun! love the chevron patterned bag! this card is amazing, and what a fun stamp set. the little baggy was a perfect touch! Cute project Amy! Love the strips of tickets! What a sweet, little holder, Amy! Lovin' the chevrons!